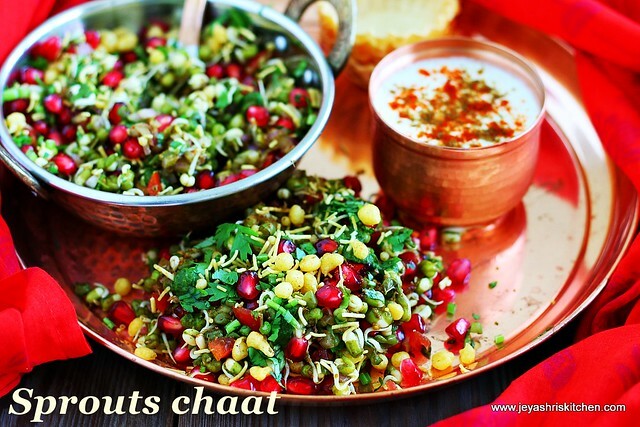 Sprouts chaat is a healthy snack recipe suitable for all ages. This can be had as a tea time snack or a mid morning snack or can be served with papdis as a regular papdi chaat too. 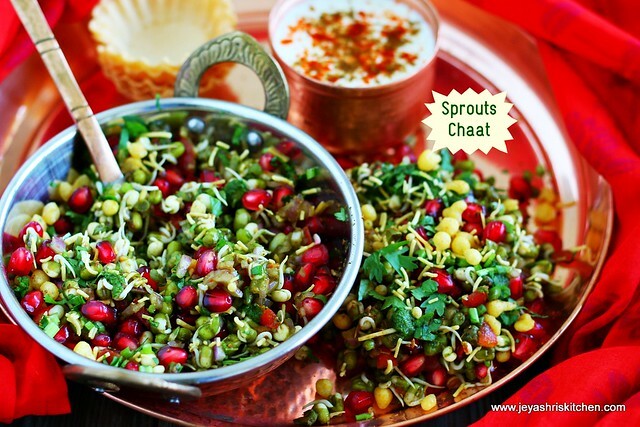 When I went live on facebook from Jeyashri's kitchen page, on Women's day, i was mentioning about the healthy snacking on Sprouts chaat. After that i wanted to post the chaat recipe here. There is no hard and fast rules in making this chaat. Be creative in adding up the ingredients and make your chaat more tasty and healthy. Follow jeyashris kitchen on Instagram and facebook for updates. In a bowl add the sprouts. You can steam the sprouts in a cooker(wihout whistle) or a idli maker for 2-3 minutes too. Add finely chopped onions, tomatoes, green chutney, tamarind dates chutney, cumin powder, chaat masala, salt, red chili powder. Mix well evenly. Add a handful of pomegranate and little coriander leaves. Garnish with boondi |sev. You can add finely chopped apples too. Finely chopped cucumber |carrots can be added to make it healthy. Instead of sev | boondi fire roasted papad can be added to give crunchiness. Mixed sprouts can also be used. A dash of thick spiced yogurt can be added to the chaat before serving.